This luxurious jumbo bed by Petface will help to let your pet relax and sleep comfortably by keeping them warm and giving a feeling of security. 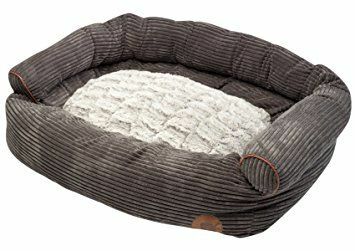 This sofa style pet bed has a grey corduroy outer with brown piping, a super soft removable faux fur cushion and an anti-slip base to prevent it from slipping. Available in one size only, this bumper bed measures: Bed: 84cm x 59cm x 34cm (33" x 23" x 13.5") & Cushion: 71cm x 52cm x 25cm (28" x 20.5" x 10") approximately. The filling can be removed from both the bed and the cushion via three zips and the cover can be machine washed at 30c, however it should not be tumble dried or ironed.